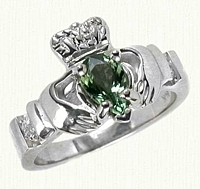 Celtic Claddagh Custom Rings with Gemstones @ affordable prices online! 14kt white gold ring with yellow gold cuffs and raised rose gold heart. Two .05 ct stones (2.4mm diameter) adorn either side of the cuffs. Ring tapers from 2mm at the back to 3.25mm at front. 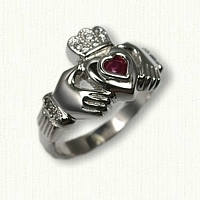 Heart to crown measures 7mm. 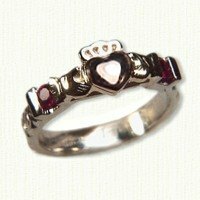 14kt white gold ring with yellow gold cuffs and raised rose gold heart. 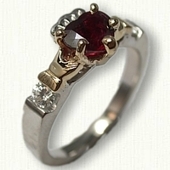 Two 3mm (.14ct each) rubies adorn either side of the cuffs. Continuous Heart Knot pattern is used on the shank. Ring tapers from 2mm at the back to 3.25mm at front. 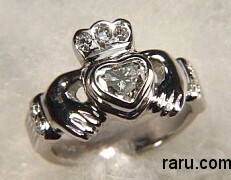 Heart to crown measures 7mm. 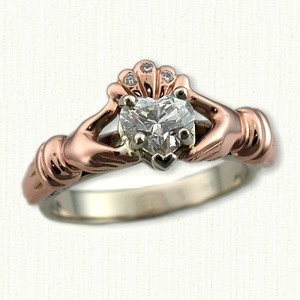 14kt white gold custom patterned shank, yellow gold hands and cuffs with rose gold heart. Bezel set .10ct diamond and two 3mm rubies. Please E-mail for a quote. 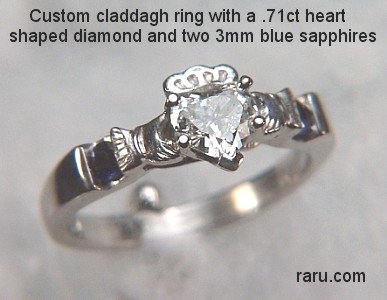 Diamonds are of G-H color and SI1 clarity. 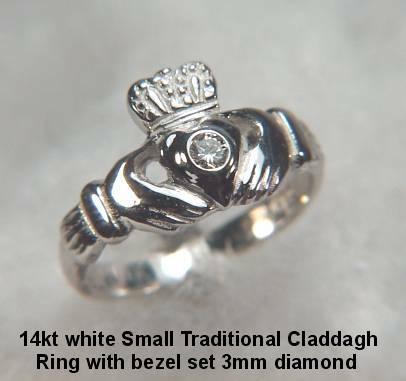 ONLY available with a 3mm round stone. The ring will hold a 5x5 mm lab created heart shaped emerald. The sides are adorned with two .10ct round diamonds. 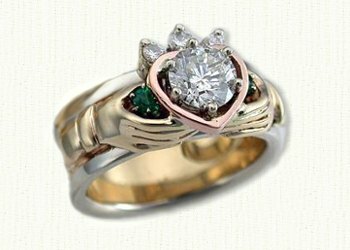 Heart shaped emerald is only available in lab created form. 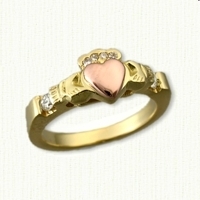 14kt yellow gold ring with 14kt rose gold hands that holds a 0.53ct heart shaped diamond. Available with most 4 x 4mm heart shaped gemstone. 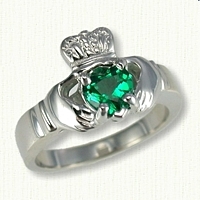 EXCEPTION: Heart shaped genuine emeralds are NOT available - only synthetic or Chatham. Please call for pricing if you would like to set a different round cabochon (domed) stone. and eleven .01ct diamond melee. 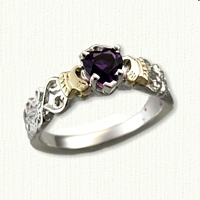 Available with diamonds, rubies or blue sapphires only. 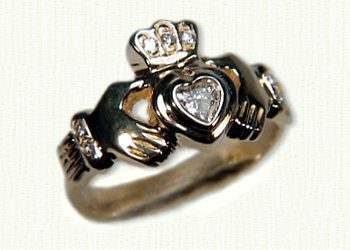 14Kt Yellow set with .25ct - 4x4 heart shaped diamond and seven .01ct diamond melee. Platinum Available in sizes 6 to 11. 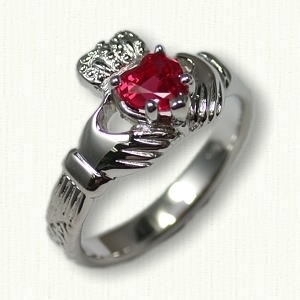 Only available with 4x4 stone; crown and cuffs accent stones only available with diamonds, rubies or blue sapphires. 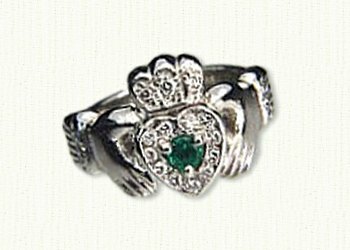 CLAD #1813 - Medium traditional Claddagh ring set with one approximate .15 carat round emerald and 18 -.01ct diamond melee. We have set 3 diamonds in the crown, 2 diamonds in each cuff and 11 diamonds surrounding the emerald. 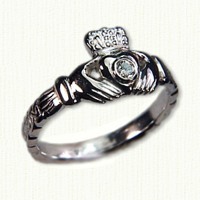 This ring is available in platinum , 14Kt or 18Kt yellow gold with a 14Kt white gold heart to enhance the diamonds. Any round gemstone may be used in the center, please call for pricing. 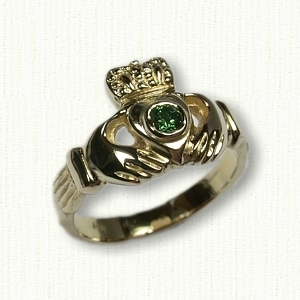 Only available with diamonds, rubies or blue sapphires around the heart and in the cuffs and crown. 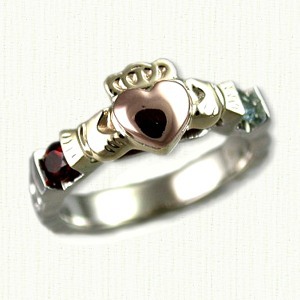 Shown 14kt yellow and white gold with rose gold heart Custom Graphic fee applies. 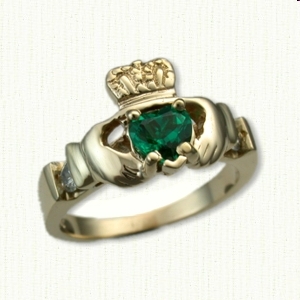 .75ct center diamond with two .15ct side emeralds. 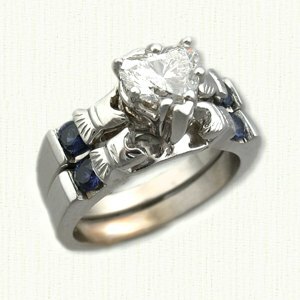 Shown 14kt White gold. Custom Graphic fee applies. .73ct center diamond with two .10ct side sapphires.. Custom Graphic fee applies. Ring is sleeved and 10mm in width. This ring is only available with diamonds in the crown and cuffs. 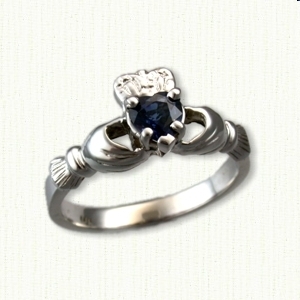 Center heart shaped stone may be a diamond, ruby or sapphire. two 2mm emeralds and two 2.75mm amethysts. Custom Graphic fee applies. Ring is sleeved and 9mm in width. 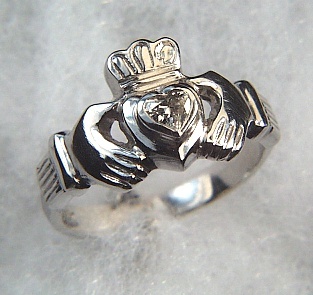 The Gimmel Ring is a unique version of a Claddaugh Ring. 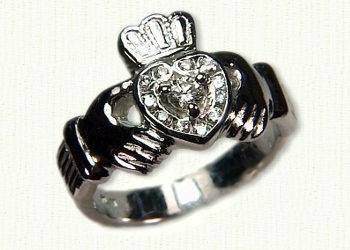 It is made of 3 rings (a heart and two hands) which interlock. 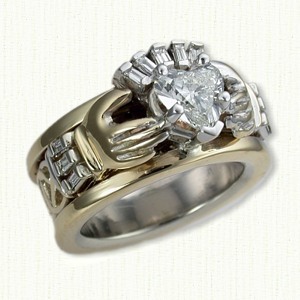 These rings are only available in gold or platinum. 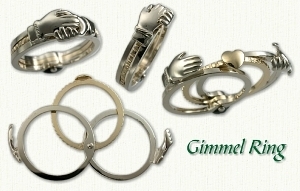 Visit our Gimmel Ring Page for more information, styles and pricing.